What do you think of when May 1 comes along? 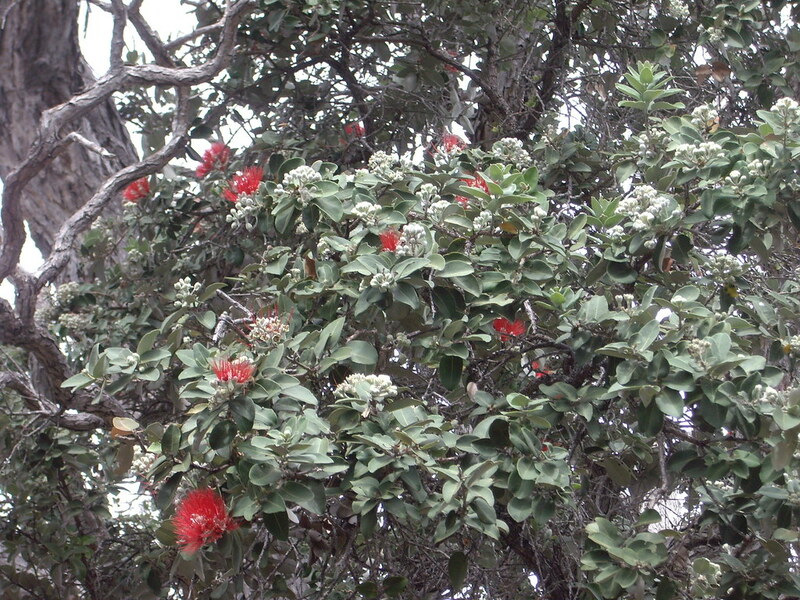 The Lehua blossoms on the Ohia tree above are one sure sign that we are on the verge of summer. By May 1, the trees are loaded with red blooms and more are opening up. 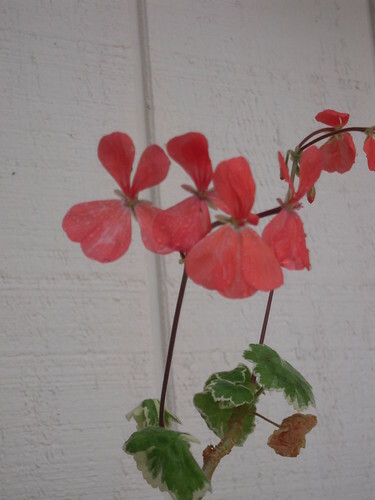 When I was a little girl many moons ago, on May 1, we made little baskets to hang on the door knobs of neighbors. Sometimes these were baskets folded out of construction paper strips that we had made in school. Not as frequently, we were able to go to the “dime store” and buy a few little woven straw baskets. Whatever we used, we filled them with flowers as our way of saying “Happy Spring!” on May 1, or May Day. Even today, May Day is celebrated here in Hawai`i as “Lei Day” with hula, everyone wearing lots of leis, and the crowning of the May King and Queen in the schools. When I was a senior in high school, I was a member of the May Queen’s court. As a child, I enjoyed dancing the May Pole Dance, which originated in Great Britain. For those who have ever done any sailing, “Mayday!” meant a life and death situation at sea. Fortunately, I never had to radio that emergency when I lived on board my boat. 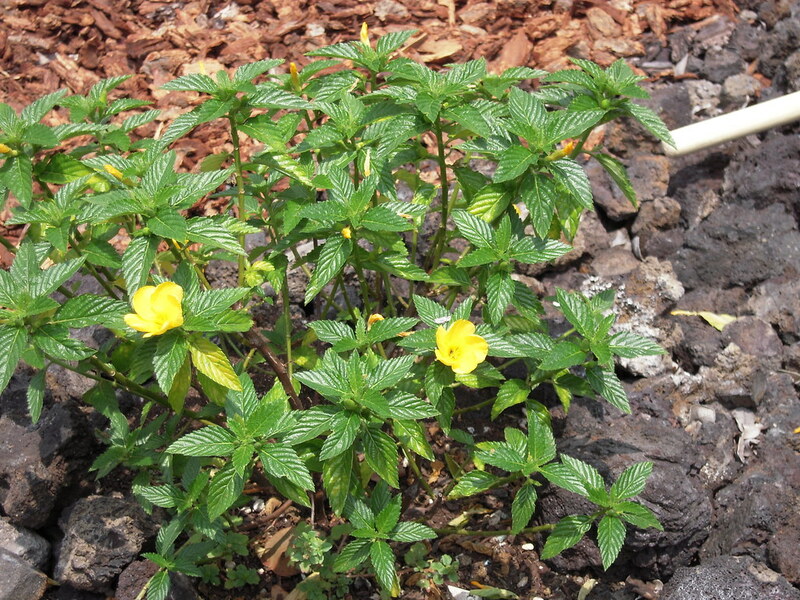 However you think of “May Day,” it primarily means lots of flowers and a feeling of new life in our gardens. Here are a few signs of “new life” as we begin the month of May. I call this my “Buttercup” plant because of the many yellow blooms that cover it. Some have already fallen off but there are many more buds ready to open up. 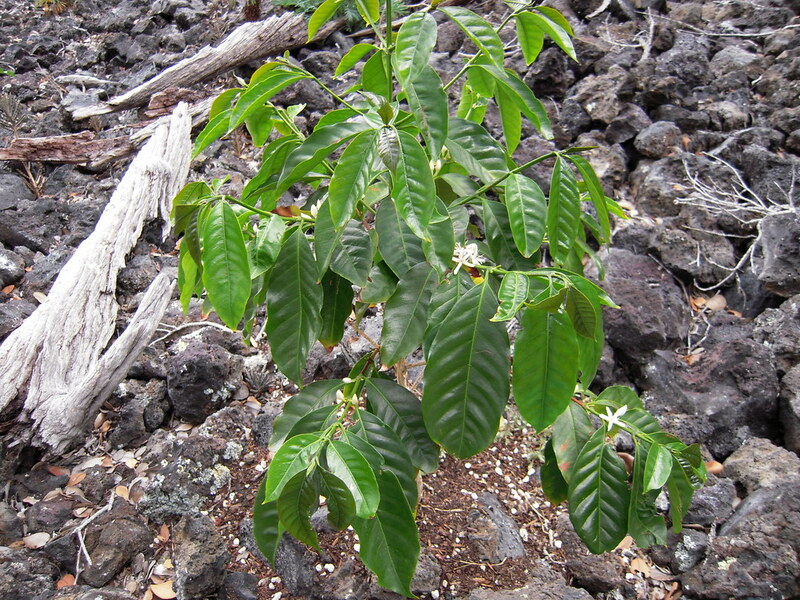 Blossoms on my little coffee tree was one of the many surprises I found this past week! What do you think the chances are that I’ll get a cup of coffee out of this? and one Canna Indica. I can hardly wait to see these all sprout. Somehow, I have squash vines coming up in the oddest places, especially where I did not plant them! I think the birds have left me these gifts. 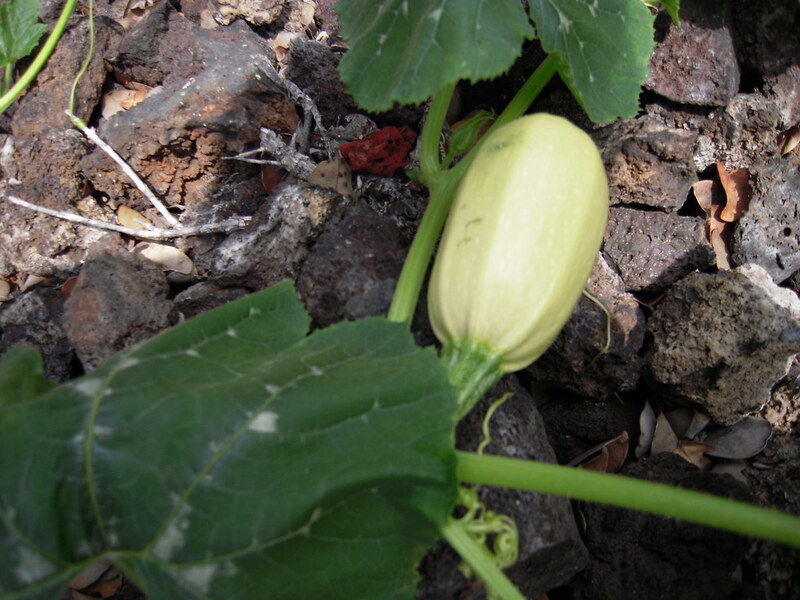 At any rate, here’s one of the squash plants that many people around here eat. Sometimes they get about two feet long! The vines must be spreading out at least four or five feet. Here is a squash and I have no idea what kind it is. I have another one growing where I planted okra! The fig tree my daughters gave me last spring has five branches covered with figs. Here is just one branch! 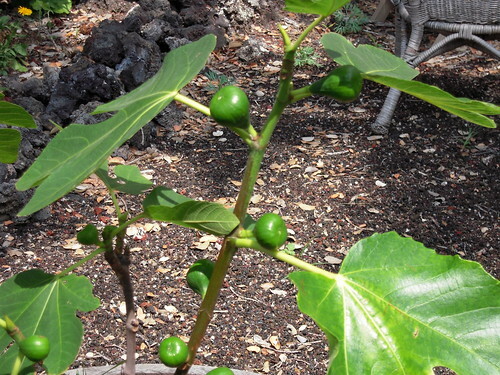 There were two figs on it last summer and they were sweet. It looks like I’ll have more than two to eat this year, if the birds don’t get them! 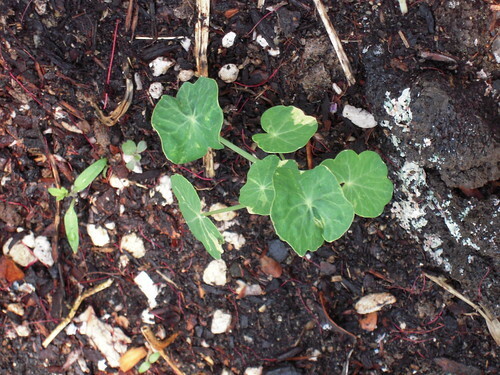 I’ve planted nasturtiums to cover some of the areas that are not hospitable to other plants. They have just started to come up. My donkey tail is getting plump. 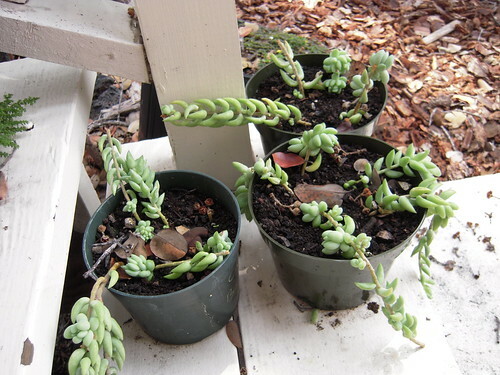 I need to make or buy some macramé hangers to get them up where they can really grow. 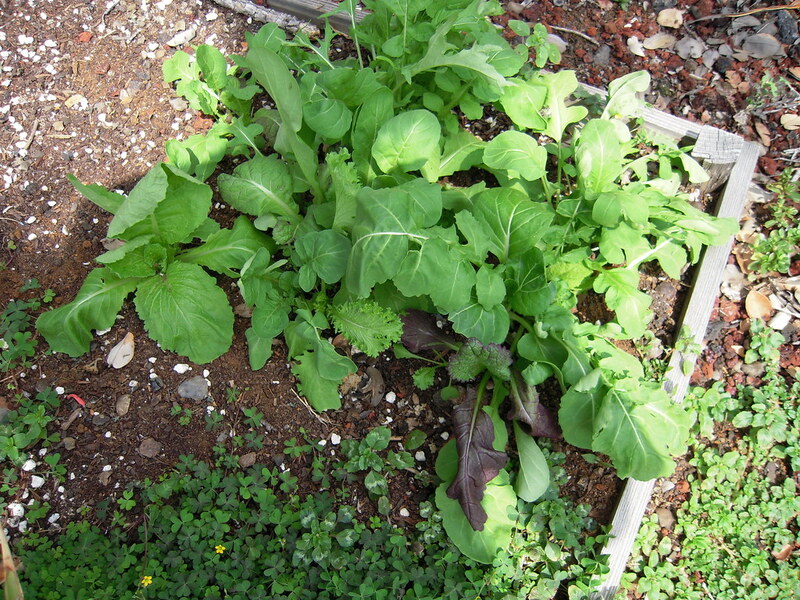 My mixture of salad greens is about ready to give me a little salad. Along with the salad makings, I have several beautiful basils. Here is the Siam Basil. 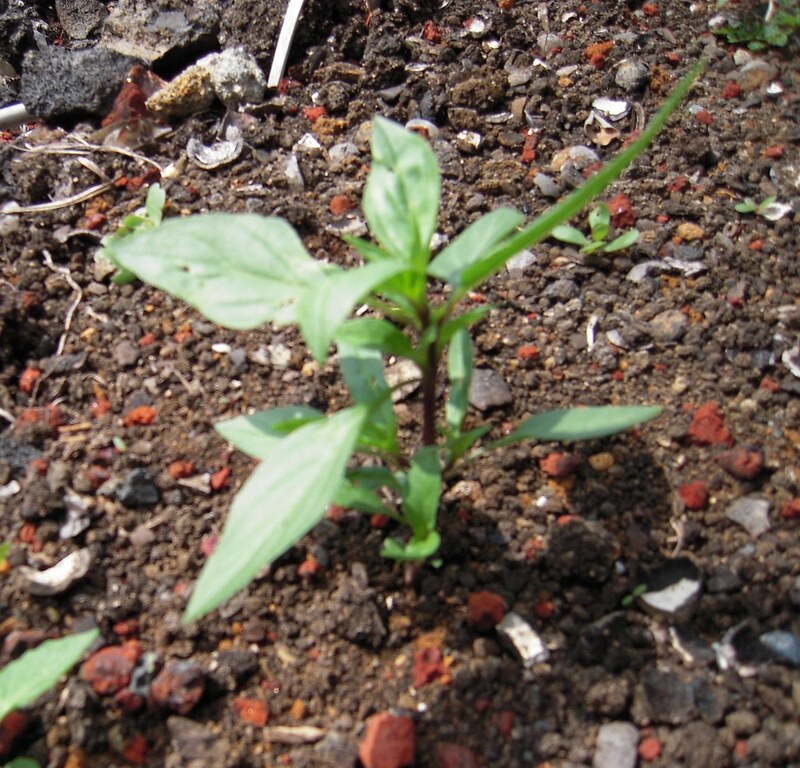 I have planted Holy Basil, also, but it’s not big enough to see yet. 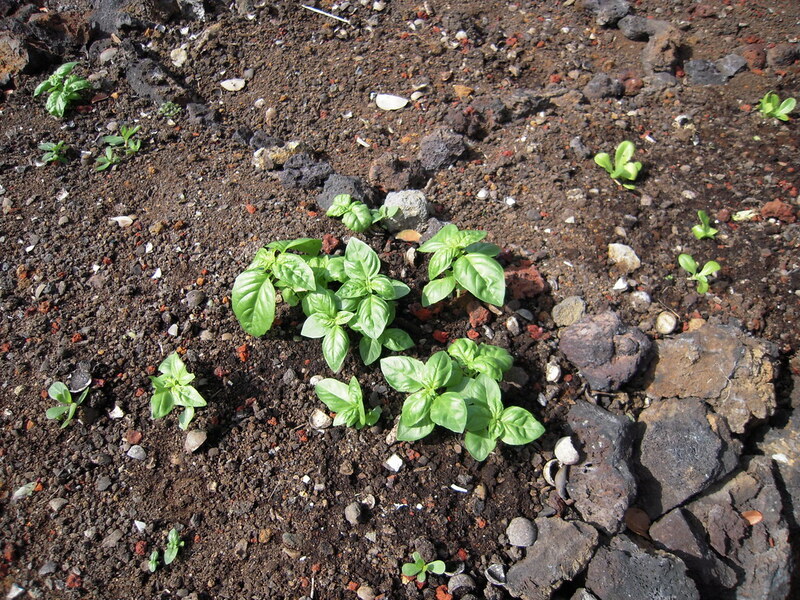 The Sweet Basil is growing like crazy, however. This picture was taken last week, and it’s about three times as big now. 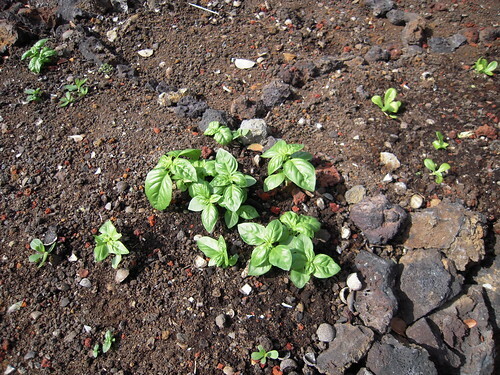 You can see the small lettuce plants a student gave me beside the basil. The other day, I ate a fresh sweet basil, tomato, and Jarlsberg cheese sandwich on whole grain bread that was heavenly. 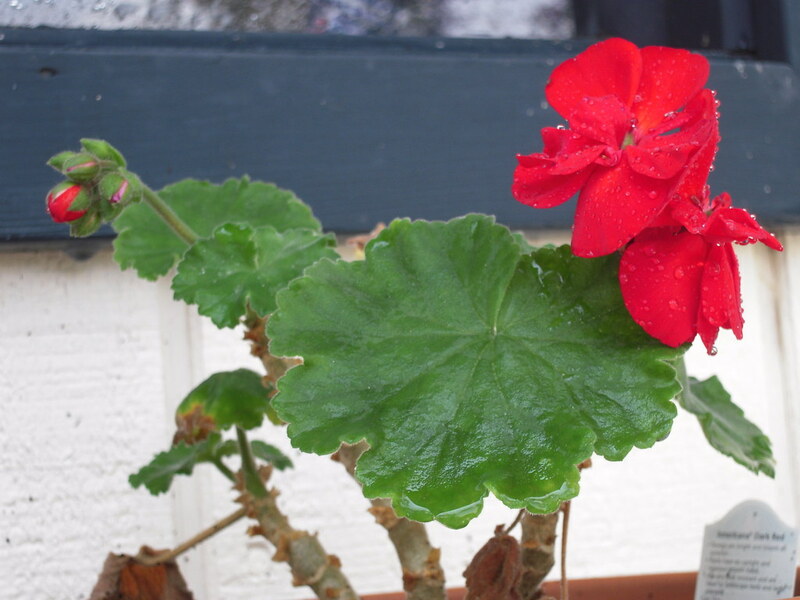 A common flower, but one of my favorites, is the geranium. 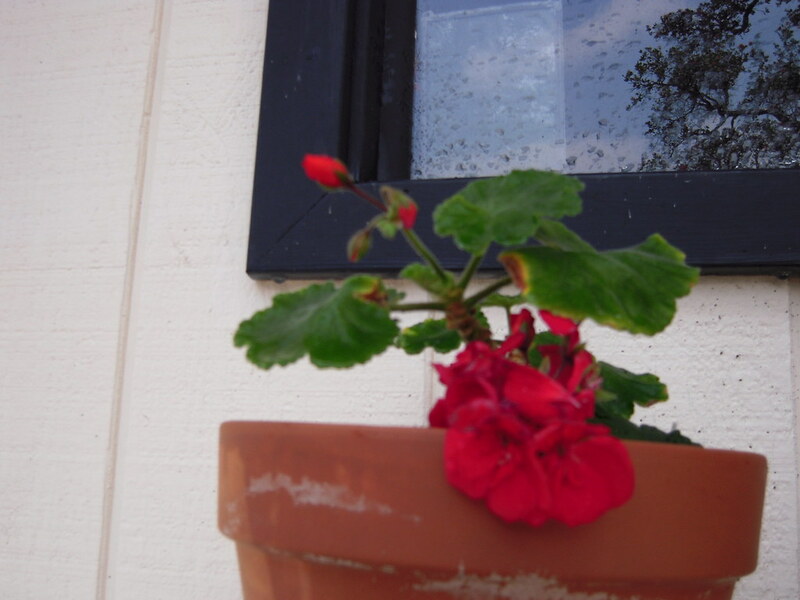 These red ones are in pots outside my kitchen window, taking their cheer inside. This peach colored geranium is starting to get a little growth on it. Today I did a lot of pruning, planting, watering, and weeding – then fed the weeds to my hens. On these warm, sunny days, I run out of time with so many projects to take care of. Once school is out (just one more week! ), I’ll be able to spend more time outside. Posted on November 24, 2018 November 24, 2018 Categories ResearchLeave a comment on May Day/Lei Day!